This playoff season has not been short on misbehavior by fans. Reports of spectators fighting and even urinating on each other were seen as out-of-line by even the rowdiest of fanatics. He is the best coach & referee who never made it to the Super Bowl, and he makes that known. Any time our whinebacker disagrees with the course of the game, his displeasure is voiced for all to hear, until long after people stop listening. He also tends to take control of the remote to rewind parts of the game nobody asked to see. The only thing he is good at is ruining the game for everyone else. There is no such thing as a “stolen” seat on game night. Once you get up from your seat for whatever reason, don’t expect it to be open when you return. If you don’t even bother to make a snack or beer run, forget about asking for it back. This character uses locker-room language, forgetting that he is at a party where such words are really unnecessary – especially when there are children around. What’s also unnecessary is talking about things that have nothing to do with the game – the Offensive Cackle likes to do this as well. Off topic conversations should take place in another room as to not interrupt viewing (this goes for commercials too!). Talk at halftime should center exclusively on how bad the performers are. The cost of entry on game night is to not come empty handed. This one friend is either ignorant or too cheap to follow. If you’re bringing food, unless you roll with the kale and granola crowd, the cheesier and greasier the better. A case or two of beer should get you the VIP treatment. A small host gift is also a good idea. Few Super Bowl parties are missed by that sloppy drunk. When he manages to miss a party, few people miss him. Considering the evening is a rather long one, especially for those non-football fans, resolve to pace your drinking. If you plan on driving, perhaps stop drinking after the third quarter, just like the stadium fans do. 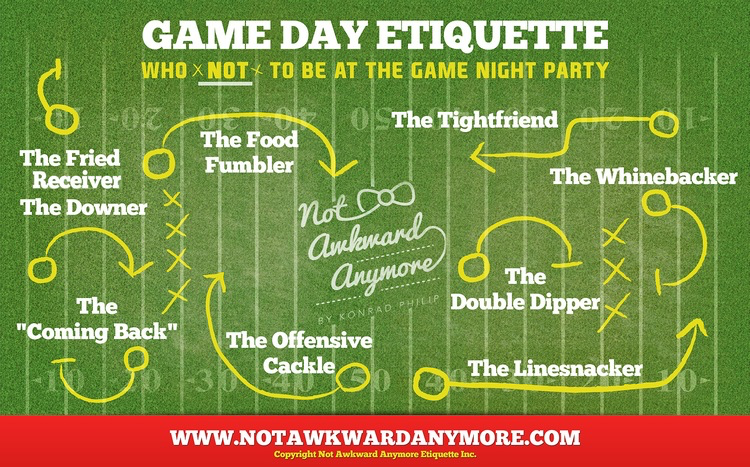 Though health experts continue to debate the science, etiquette experts are clear, double dipping is not o-queso! If you are eating a large chip and insist on dipping it more than once, place some dip on a separate plate for yourself. Showing up in a losing team’s jersey and with a bad attitude are common practices of the downer. Show at least some enthusiasm and remember that this is not the time to tell everyone how much you hate football and only watch it once a year. He makes the buffet his own and samples things while his fellow guests are left wondering if there will be anything left for them. When approaching the buffet table, grab what you need and step away to let everyone fill up before the game starts. A game night party will inevitably result in a moderate amount of mess (which guests should offer to clean up). The food fumbler exceeds this standard by sending hot wings flying onto the carpet and leaving behind a torrent of chip crumbs. Often an alter ego of the Fried Receiver, the Food Fumbler is advised to apologize and to offer to take responsibility for any resulting cleaning costs. If after reading this list you have self-diagnosed yourself as one of the above, resolve to rehabilitate yourself (there’s still time! ), or stay home on the big day. Lastly, if you do choose to attend a Super Bowl Party, remember the golden rule of parties – never be the first to arrive or the last to leave.